The Hobby Lobby decision may mark a rhetorical turning point in the interface between religious rights and individual rights. 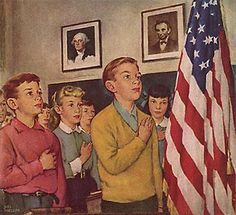 For decades we have been focused on one part of the Pledge of Allegiance (“One nation, under God”). But now I think our social imagination has shifted to the latter phrase (“with Liberty and Justice for All”). Then we’ve individualized that last phrase, so that the focus is on each person’s liberty and justice. Trying to navigate the space between various people’s individuality leads to the conflicts that seem never ending across the internet and media. Such ignorance almost certainly does play some role, but that cannot be the whole story. Given his defective understanding of what religion is—and, for that matter, what a business is—the secularist genuinely doesn’t understand why the owners of a company would feel their consciences were at stake in the company’s actions. His concluding lessons are fairly optimistic but took some turns to get there. But it was the quote that caught my attention. The “secularists” I read after Hobby Lobby understood that the Greens had issues of conscience. But they also were thinking of the impact of that decision of conscience on other individuals. They were calculating potential harm done to others in the process and found that unacceptable. My friend David Fitch posted an 2013 article from the New York Times titled “Generation LGBTQIA” (which for some reason was in the Fashion and Style section). It told the story of how the LGBT label became inadequate because it didn’t include enough possibilities to cover each person’s experience. (Q is for Queer, I stands for Intersex and A stands for Ally). The implication is that each personal expression of sexuality and/or affinity must be affirmed as an expression of true individuality. Still, the alphabet soup of L.G.B.T.Q.I.A. may be difficult to sustain. “In the next 10 or 20 years, the various categories heaped under the umbrella of L.G.B.T. will become quite quotidian [mundane],” Professor Halberstam said. I read an interesting piece by Derek Rishmawy titled “I Used to Believe X for Reason Y…and the Failure of Intellectual Imagination.” He suggests that our focus on personal story can sometimes lead to overgeneralization and ad hoc conclusions. He says we need conversation with those others to protect us from logical error. Derek was writing primarily about young evangelicals telling conversion stories away from what they used to believe. As much as I think story is really, really, important I’ve always argued that story is only the beginning of dialogue and not an end in itself. But I readily acknowledge that in the broader society we have a tendency to speak only from personal experience and validate that over others’ experiences. Sociologically, I want to place the impetus for all of the above on the prioritization of individualism within western society. It’s been nearly 30 years since Habits of the Heart documented the damage that rampant individualism does to community. Over those three decades, what Durkheim called “the cult of the individual” has only grown stronger. As Durkheim predicted, this is a result of increasing diversity and changing bases for social solidarity. In the midst of pondering how we shifted to the last phrase of the pledge of allegiance, about liberty and justice, the whole libertarian thrust came clearer to me. All these years of celebrating individualism in politics, movies, reality television, social media, the blogosphere (hello? ), and education (especially higher ed) have taken a toll. It seems to me that we are less interested in liberty and justice for all as we are in liberty and justice for each person. And that’s an untenable situation. There will be winners and losers. There will be some liberties that are sacrificed for others. Some people cannot pursue their liberties without infringing someone else’s. Also today, Tobin Grant posted some very interesting data on the changing role of religion in society. 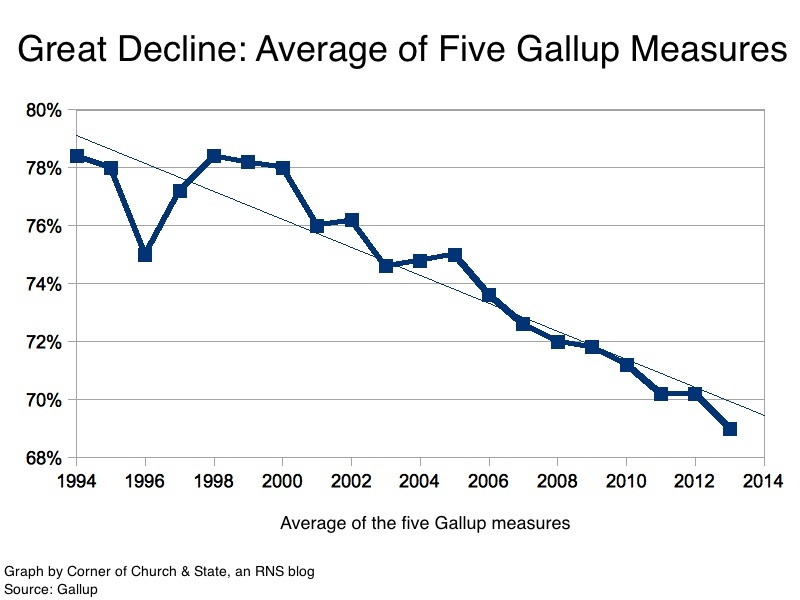 He analyzed five different measures of religion in American life that Gallup has tracked over the years: religious identity, church attendance, membership, religion’s importance in life, and religion’s relevance for today. All five of these show a dramatic decline. Then he statistically combines them into one measure and shows that change. My initial impression was that I’d tell my stats students that the truncated Y axis makes the decline look more dramatic than it really is. After all, it’s only a drop from 78% to 69% over 20 years. But then I got to thinking that there may be something more happening. Perhaps there’s some tipping point below which religion is no longer the “one nation, under God” factor (more Durkheim). Maybe once we have 30% of the country thinking that religion is okay if that’s what you choose, then all we have are competing individual values. Their common refusal, together with that of their predecessors, to acknowledge the impossibility of fairly delimiting what counts as religion has produced a thicket of circumlocutions and fictions that cannot, when all is said and done, obscure the absence of any compelling logic to support the laws that purport to protect religious freedom today. So what do we do? Somehow we have to find a way to recast our argument in ways that speak to common values. That can affirm the multiplicity of voices and interests present in the society. Religion will be one of those voices but perhaps not a dominant voice, at least not one with a language the broader culture is prepared to hear. So when we evangelicals make our claims for privilege, we’ll have to do so in ways that transcend our unique group interests and speak to the broad range of expressions within the society. Somehow, we’ve got to find our way back to that “Indivisible” which connects the “one nation” to the “liberty and justice for all”. Quick and dirty – seems like the demise of a unified European christian culture, brought first by alienated Protestant immigrants [“pilgrims”], then supported by Roman Catholic immigrants who came later. We got our first taste of the rising tide of divisiveness in the US with the “Bible riots” in Philadelphia in 1844, pitting “nativist” Protestants against Roman Catholics. That divisiveness was very long lasting. Well do I remember the hostility my late parents long felt for Roman Catholics well into the 1950’s, and the controversy attending the election of 1960 when Roman Catholic John Kennedy was running for office. If this is anything close to the history of where we are today, then clearly we need new institutions and leaders, capable of presenting a vision of the common good across many cultural divides, as well as capable of creating institutions, not unlike the YMCA and YWCA of old, for rooting and grounding that vision in everyday reality. I would also add the way that religious changes opened the door for rugged individualism to come in. Makes me think of Timothy Smith’s Revivalism and Social Reform or David Moberg’s The Great Reversal. Both showed a complex social vision present among evangelicals at the turn of the 20th century. But the modernist/fundamentalist controversies killed the social gospel movement as too liberal while Billy Sunday through Billy Graham focused on individual decisions for Christ. Once you add in the political alignment of evangelicalism through the 80s and 90s, you have the stage set for aligning external American individualism with religious salvation individualism (Scott McKnight’s work is great on this). One of the solutions I’ve been advocating is celebrating vibrant faith wherever it occurs. That may be in a small independent Baptist church. It may be in a downtown Chicago mainline church. It may be in a church plant by a group of neo-evangelicals trying to live in community. It may be in a megachurch in the suburbs (but that one’s harder for me). To find ways of allowing those varied groups to affirm their common search as disciples of Christ motivated by the Holy Spirit seems to hold real promise. That’s why I’ve been so hard on those who want to draw tight circles around who is “really evangelical” according to somebody’s blueprint. The definitional fights are not particularly fruitful, especially in a postmodern, post-Christian culture. « But You Canna Take My Freedom!